Oh let me have this one. Please! Why else would Macaulay Culkin be skulking around in London at the same time Ashton Kutcher and Mila Kunis happen to be living there? OK, fine, there could be plenty of reasons but Macaulay Culkin Stalking Mila Kunis just makes my heart so much happier! 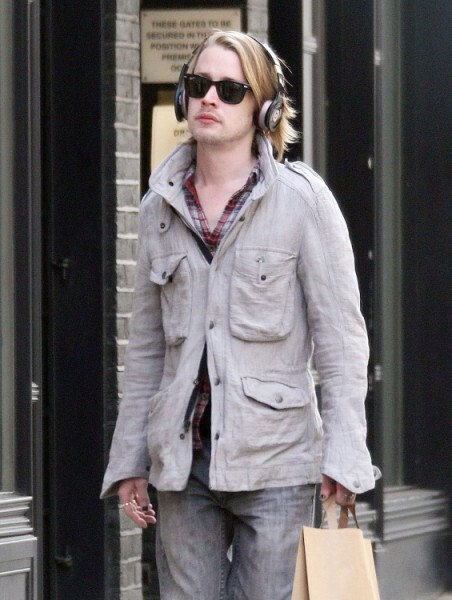 So we have pics of Macaulay doing a little shopping in London’s Covent Garden this morning. Yes, he looks like a super rich bum who’s spent the last few nights under a comfortable bridge but at least he doesn’t look as strung out as he did before. Job well done! Anyway, Fame Flynet Pictures just had to point out that he’s staying very close to ex-girlfriend, Mila and her current squeeze Ashton. The two are living together while Mila finishes up shooting her new movie, Jupiter Ascending. Could it all just be a coincidence? Of course it could but, as you know, I so don’t want it to be. Does anyone out there know if he owns a house in London? Macaulay Culkin has stupid crazy money so it’s possible. I don’t think he does but I can’t be sure. He has been spending a lot of time in Europe lately. A couple weeks ago there were pics of him hanging out at an amusement park in Paris. Maybe he’s doing an European tour. Is it so out of left field to be in the same European capital as your ex while she’s working? I guess not…. Only it’s Macaulay. He can be an odd bird. And I’m pretty sure he’s single so I want to make some sense out of this. And I can’t stand Ashton Kutcher so I’ll try to hook Mila up with virtually anybody else. What do you think? Is this just wishful thinking on my part? Is the Mila Kunis/Macaulay Culkin saga closed for good or could he possibly be trying to stay in her radar? Macaulay Culkin Clean And Sober Looking For Once, Trying To Win Mila Kunis Back? Ashton Kutcher Terrified Mila Kunis is Cheating on Him–Steals Her Phone and Tries to Catch Her! Demi Moore, Ashton Kutcher Divorce Going To Trial, Demi’s Tired Of Ashton Using Her!